Forest fires have adverse ecological and economic effects and are a major concern in many countries, including Nepal. During the long, dry summers, Nepal experiences many forest fires. In 2016, a record number of fires were reported killing 15 people and consuming an area of 13,000 square kilometers (1.3 hectares) in the span of just two weeks. The frequency and severity of these fires highlight the need for public officials to quickly communicate information about forest fires to vulnerable communities to prevent the loss of life and mitigate environmental damage. To address this challenge, SERVIR-Hindu Kush Himalaya at the International Centre for Integrated Mountain Development (ICIMOD) in close collaboration with the Department of Forests of Nepal, developed a satellite-based forest fire detection and monitoring system that uses Earth observation data with large-area repetitive coverage for near real-time fire detection, monitoring, and burnt area assessments. Once a forest fire is detected from space, a text message alert is sent directly to people living in affected communities providing critical information on the size and location of the fire. The system carries out automated data acquisition, processing, and reporting on locations of active fires present during the satellites’ twice-daily overpasses, automatically adding important information such as administrative units, land cover type, elevation, and slope. With each satellite overpass, if a forest fire is detected, the system delivers mobile phone text messages to subscribers in the affected area. These alerts, delivered within 20 minutes of detection, have the ability to reach hundreds of District Forest Officers and local community representatives across all districts in Nepal. The information is also published through a web mapping application that allows for dynamic visualization of fire locations on any given day or in a user-specified time period. Finally, the system allows registered users to download maps with forest fire incidences on any given day. The system was developed using space-based technologies and applications, in particular, Moderate Resolution Imaging Spectroradiometer (MODIS) from NASA’s Terra and Aqua satellites, which provides an all-in-one solution to address challenges typically faced by foresters. For example, consolidated information can be provided on hazard zones, vulnerable areas, accessibility, affected settlements, mitigation options, and future predictions to support disaster preparedness. 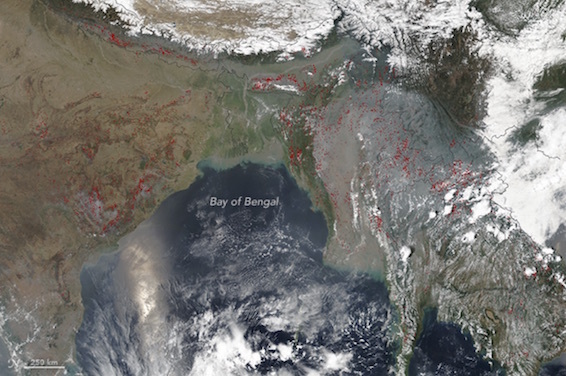 As an upgrade to the system, researchers at ICIMOD recently incorporated data from the Visible Infrared Imaging Radiometer Suite (VIIRS) – a sensor on NASA’s Suomi satellite – to complement the MODIS data. The result is both enhanced spatial resolution over fires of relatively small areas and improved mapping of large fire perimeters. 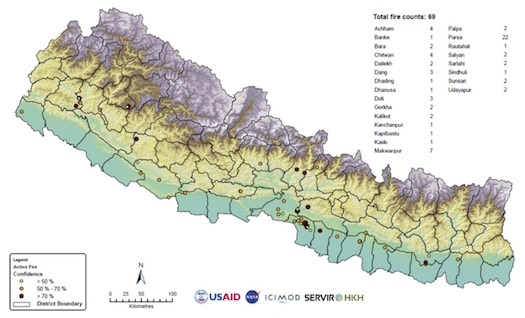 A mobile application – Nepal Forest Fire Detection and Alert – was deployed to support citizen reporting on fire incidences in Nepal and the system has already been helpful in planning and allocating resources for forest fire management. Through the use of this application, members of forest community groups can now respond more quickly to fire dangers and Department of Forest officials can better understand forest fire patterns to help inform future management strategies. Three years into the rollout, the forest fire detection and monitoring system is now on permanent display at the Department of Forests headquarters in Kathmandu Nepal, with a screen providing near real-time data on current fire conditions in the headquarters’ lobby. The Department has also taken up ownership of this application and is developing a dedicated unit to consolidate action on the ground and update and manage the system in-house. After a successful rollout in Nepal, this system — the first of its kind in the region — has been expanded to Bhutan where it is providing officials and the public with a new, effective forest fire management tool. In the years ahead, it is expected that this system will continue to play a major role in improving the management of the region’s valuable forest resources.